"Many Western countries are worried that the Syrian government continues to possess some of the precursors of sarin." THE HAGUE, Netherlands — The head of the world's chemical weapons watchdog has questioned whether Syrian President Bashar al-Assad declared his entire arsenal. Ahmet Uzumcu, director general of the Organization for the Prohibition of Chemical Weapons (OPCW), highlighted that attacks involving chlorine barrel bombs and deadly nerve agent sarin have continued despite the landmark agreement that won the group a Nobel Peace Prize in 2013. Syrian “authorities have to explain in a plausible, technically plausible manner why the samples collected by our experts did prove the existence of certain chemicals which were never declared,” Uzumcu said in an interview with NBC News. "So they should explain why those chemicals were present in such places." 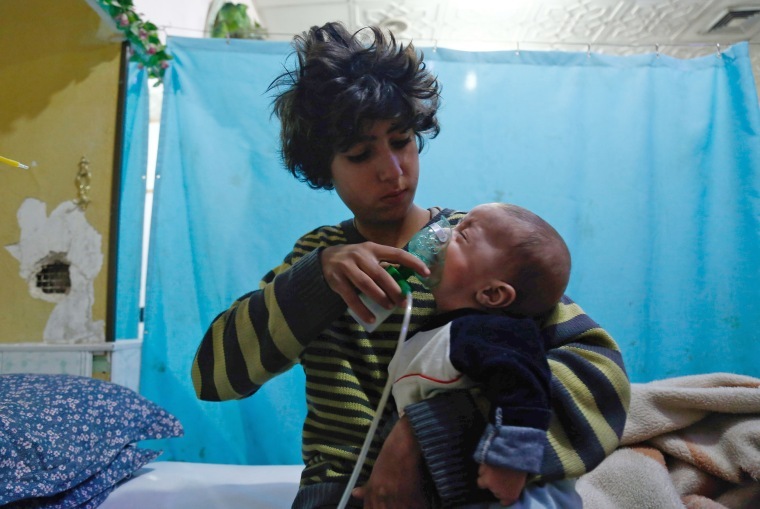 According to Uzumcu, the use of sarin in February 2017 raised concerns that Syria might have kept certain banned substances despite Assad's government saying it surrendered its stockpile of chemical agents in 2013. Syria could have also redeveloped or reacquired them. "Many Western countries are worried that the Syrian government continues to possess some of the precursors of sarin," he said. The OPCW chief's comments came after a number of deadly suspected chemical attacks by Syrian government forces. Syria and ally Russia consistently deny that such incidents have taken place, or say that rebels fighting to unseat Assad are responsible. After a recent attack northeast of Damascus that activists and aid groups said killed dozens, Russia and Syria were accused of holding up inspections and tampering with evidence. Uzumcu said a key issue hindering the OPCW’s work was that its current mandate was to only determine whether such attacks have taken place, and not who carried them out. In November, a Russian veto stripped the organization of a mechanism that had allowed it to probe and assign blame when banned chemicals were used. In 2013, the OPCW declared Syria had destroyed or rendered inoperable all its declared chemical weapons production and mixing facilities as part of a disarmament program. Under the Russian-American brokered deal, Assad's government agreed to destroy all its chemical weapons after Washington threatened to use force in response to the killing of hundreds of people in a sarin attack on the outskirts of Damascus. The OPCW won the Nobel Peace Prize that year for its work in Syria and elsewhere. Meanwhile, Syria assumed the presidency of the 65-nation, U.N.-sponsored Conference on Disarmament on Monday. This position is held on a rotating basis in alphabetical order so Switzerland precedes Syria and Tunisia follows it. Syria's civil war has been raging since 2011, displacing millions of people and now involves forces from countries including Iran, Russia and the U.S.
Laura Saravia reported from The Hague, and F. Brinley Bruton from London.